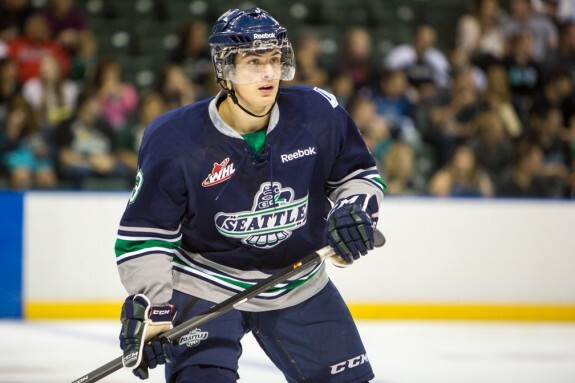 A steady riser in this year’s draft, Mathew Barzal is everything you want in a two-way center. He may not have the size (6’0″), but you wouldn’t know that by the way he plays. Not afraid to take on players much bigger than himself, Barzal is one of the most determined players I’ve watched all season. The majority of hockey fans love to watch highlight reel goals and a sustained offensive pressure. Barzal can neutralize an opposition’s breakout with his hard work, positioning, and ability to read the play in all three zones. Barzal constantly has his feet moving and seems to be in the middle of every play capitalizing on loose pucks and dominating the transition game. He’s also relentless on the forecheck and backcheck. I’ve lauded his defensive play, but now it’s time to look to his offensive game. Barzal has a nifty set of hands that he prefers using in and around the net. With impeccable vision around the ice, he loves to set up teammates for goals more than keeping the attention on himself. The BC-native has powerful legs that allow him to reach top speed in a few, quick bursts. His breakaway speed rivals some in his draft class. While many see Barzal as having a lot of offensive upside, I see him as a premier two-way center who can be used at equally on the powerplay, as well as the penalty kill. It’s quite difficult to find players who are as gifted defensively as they are on the scoresheet. Barzal very well could be selected in the bottom half of the top 10, but a safe range would be 11th-15th overall. Barzal has played for Team Canada twice. In 12 games overall, he’s scored 5 goals and 6 assists and while capturing a bronze and gold medal. Top-six elite two-way forward that will be used in any situation.